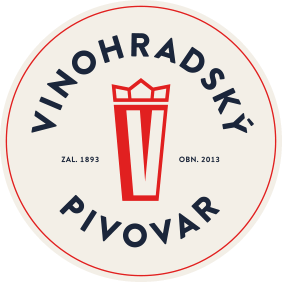 Vinohradská 11 (alcohol content 4.2%) is an unpasteurized and unfiltered standard Pilsner style beer with rich hoppy flavour of Žatecký poloranný červěňák (Saaz) and Premiant. It is characterized by a full body and golden colour.. We use Pilsner and Bavarian malt made by the traditional methods, i.e. barley is dried on malt house floors. Vinohradská 12 (alcohol content 4.8%) is a premium Czech/Pilsner style of bottom-fermented beer made with only Saaz and featuring slightly darker appearance than the Vinohradská 11. Jantarová 13 (alcohol content 5.0%) is a special copper-coloured, amber beer with a full body and a hint of caramel. The colour and caramel taste is gained by adding a bit of roasted malted barley. The combination of Žatecký poloranný červeňák (Saaz) and Premiant hops give the Jantarová 13 a unique taste and have made it popular abroad, especially in Scandinavia. IPA 14 (alcohol content 5,9%) is a special top-fermented beer with a large amount of American hops giving it a stronger flower aroma. The beer is brewed with Sládek, Amarillo and Cascade hops. Bavarian, Pilsner and caramel malts are also used. Stout 17 (alcohol content 6,7%) is top fermented dark beer made of five different types of malt as well as roasted barley. This beer has thick foam and very dark color, light hops aroma and intense coffee taste.